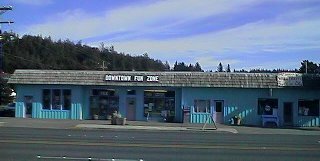 The Downtown Fun Zone Building is located on Highway 101 along the scenic rugged coast of Oregon. 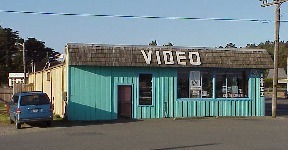 We provided business and entertainment products and services to Port Orford from 1990 to 2012. The building is currently FOR SALE! Asking price is $225,000. For information, contact 'Neath the Wind Realty at (541) 332-9463. As of April 14, 2012 The Downtown Fun Zone is OUT OF BUSINESS! We published a weekly paper, Port Orford Today! Check out Evan's new blog entries at the Port Orford Plunge! This page was last modified on September 22, 2014. Questions? Comments? Problem with this page?